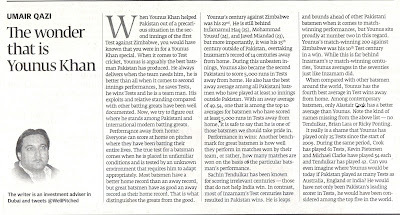 While I have been quoted by British and Indian newspapers like the Daily Mail, Mid Day, The Times; have been mentioned on radio shows in the UK and New Zealand; have been regularly published by Pakistani and Indian websites like the Express Tribune, Sportskeeda, and Cricket Country; and have had articles published in several magazines, I had never had one of my articles published in a newspaper till a few days ago. 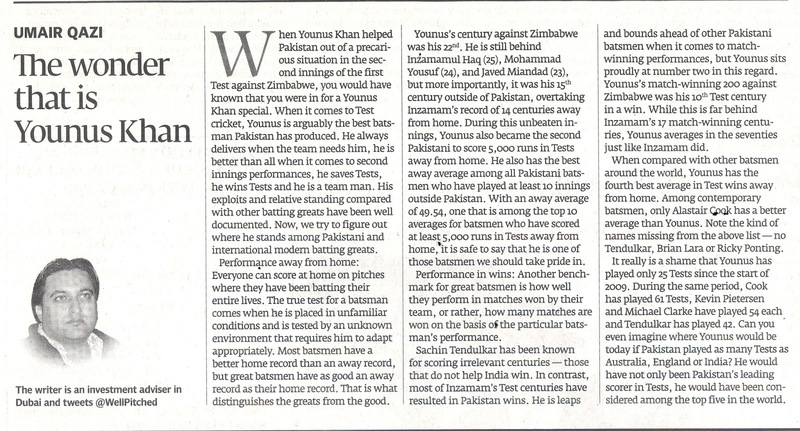 The Younis Khan statistical appreciation piece that I posted here was first published by the blogs section of the Express Tribune, and then it was published in the "Opinions" section of the print edition of the Express Tribune, dated 11th September 2013. For the first time, in a newspaper.